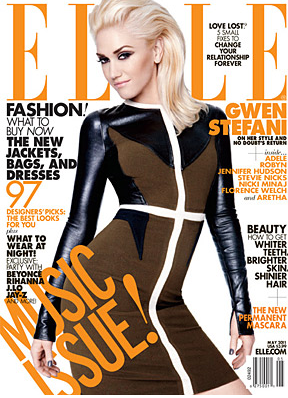 Gwen Stefani rocks the May cover of Elle Magazine, and in the accompanying interview, she discusses songwriting, performing while pregnant and her disbelief that she and husband Gavin Rossdale are still together. “The first time we ever kissed was right around Valentine’s Day–we were in New Orleans on tour. So, yeah, I always think about that because it’s unbelievable that we’ve been able to stay together. I feel so proud of us–it’s one of my biggest achievements,” she said.